If there is one picture that sums up my experience with blogging conferences so far, let it be this one. That’s what blogging conferences are for, right? An opportunity to revisit one’s pre-motherhood wardrobe, designer stilts included. After all, there be no baby in the vicinity. If you are looking for tips on attending a blogging conference, you will find none here. I am the woman who wore these shoes to Mumsnet Blogfest in November, and almost lost the will to live by the time I got to the long trudge home. Note to self: smuggle a pair of flats into the goody bag next time. Also, this picture was taken at 6am. SIX O CLOCK IN THE MORNING PEOPLE, and I was already at the train station, waiting to board a train. It was inhuman. That’s why this time I’m staying the night. So, without further ado, after a lengthy preamble, I present to you the long-awaited Single Mum Speaks “I am going to Britmums and this is what I will look like” post. My name: Min, ancient Egyptian god of fertility and lettuce. My blog: This one, obvs. Single Mum Speaks. I would say it’s the “ramblings of a mum, addicted to cake,” but although this would be true, it would also be painfully unoriginal, so I’ll stick with the official tagline: Single mother by choice, aged 35 and back living with my mother and sleeping in the bedroom I last shared with my brother in 1985. Also I’m apparently on Pinterest but like, facepalm. This is what I’m going to Britmums for, right? The Numpties’ Guide to Pinterest? Please tell me this is one of the sessions. How I look: I have recently had my hair cut off, which means nothing to any of you as you’ve never met me. I’m also very small. Is this my first blogging event: No. Please see above. I was also at Mumsnet Blogfest, and Funfest last year as well, but not been to Britmums before. I will be wearing: I will not be divulging this information, mainly because I haven’t decided yet. Hopefully something clean. What I hope to gain from #BML16: The ability to pepper my speech liberally with hashtags, overnight fame as an internet sensation, a book deal, a decent sized helping of cake, a lengthy stay in the champagne tent and of course the opportunity to meet the #tribe, including the fabulous Mumzilla, Island Living 365, Justsayingmum, Katie Tutu and Occupation Mother, all of whom I will be referring to by their online pseudonyms throughout. My tips for a great conference: Wear pink and black polka dot fur, don’t engage in any vlogging if you don’t want the results to haunt you forever, smile and enjoy yourself. *This is obviously a lie. I will not be revealing my name. Previous Post I Am Not A Strict Parent. Best ‘I’m going’ post! I really thought you were tall, how strange. Not strange that you’re not, I don’t know why I thought you were. Look forward to meeting you, Helen’s got the champagne tent, you’ve got the salad bar…!? I’ll be bringing my own personal lettuce. It can act as my minion for the day. Thanks for commenting and glad you liked the post, I’m getting ridiculously excited now! Yay! I am so looking forward to meeting everyone *does little excited dance*! Oh please wear those heels!!! They are amazing. I am cotemplating wearing completely impratical jumpsuit which requires me asking people to unzip me everytime I need the loo. Can’t wait to meet you. Also that pinterest talk, I’m right with you on that one. Don’t have a clue! Jumpsuit sounds like a great idea to me-they are always a strong look, albeit tricky in the bathroom department. So looking forward to it! Please fashion some sort of headgear out of lettuce? With those shoes, and your polka dot fur number, you’ll make quite the impression. I think the lettuce is a must. Looking forward to meeting you, and glad I won’t be the only little ‘un! I lasted several years in them pretty much constantly before I had Piglet! I am a heels girl. Flats are great for comfort, but I just don’t feel glamorous in them at all (I don’t know why feeling glamorous should be important to me, but sometimes it just is. Oh patriarchy, what have you done to me?) Looking forward to meeting you too! Brilliant – love the mention of the champagne tent – you can be my friend for sure! 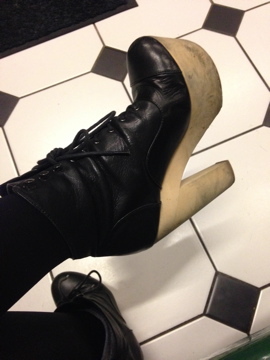 I can not get over those heels – I love them and I love heels but lesson learnt, I think! Love that I will be justsayingmum all day. Goodness, such a lot of mention of the ‘love’ word in this comment – I’m just excited and can’t wait to meet you! Same here! It’s going to be an epic day. So excited! That’s so funny-I’m wondering what I must have said to make everyone think I’m tall! You will just have to wait for the photos, I’m afraid….my clothing choices remain a closely guarded secret! I do love your list of things that you hope to gain from going to #BML16 – that would be an amazing list to be able to achieve! I think I’ll just settle for lots of cake though. Looking forward to meeting you there! Thanks-it would be fab, wouldn’t it? Here’s hoping! Looking forward to meeting you too. Very funny. I wish I could be there, not just so I could speak exclusively in hashtags, but also so I could redirect all the publishers who are looking for a leggy woman in pink and black polka dot fur towards you in the champagne tent. Also, why is there a tent? Does BML16 take place in a field? I’m pretty sure there won’t be an actual tent, just an in joke with a few other bloggers about bringing our own champagne tent! It would be awesome though. Thanks for commenting! I’ll look out for you. This will be my first blogger conference. Having signed up ages ago, I’m now getting more nervous as the date approaches. Don’t be nervous! I will keep an eye out for you too. So looking forward to meeting everyone! I totally agree-the champagne tent would be awesome! Thanks for commenting. Thanks for commenting. Looking forward to seeing you too! Thank you-I will. I’m so looking forward to it. You’d be fine, I’m sure! I think everyone is a bit nervous about going to these events. I needed to sit down at regular intervals! Yes I was! That was me. I haven’t been to Britmums before either. Look forward to meeting you properly this time! I think if we get there to find it closed or worse, non-existent, the whole place will erupt into a riot.